Home Weight Loss खबरें ज़रा हट के Shubh Mangal Saavdhan's Bhumi Pednekar Lost 25 Kilos in Just 4 Months! For the part, she gained about 25 kilos. 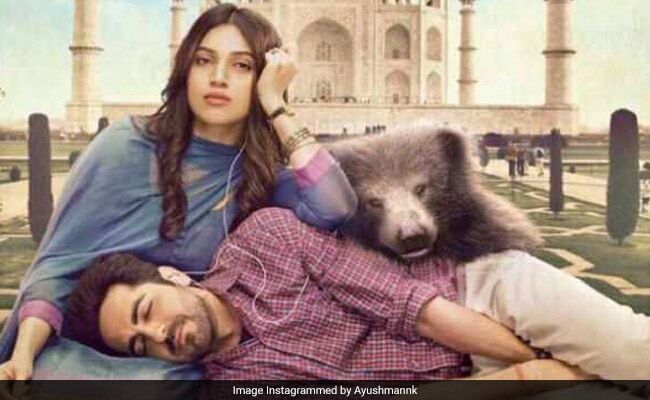 Bhumi Pednekar and Ayushmann Khurrana are back again on the big screen but this time it's different. After their praiseworthy performances in their first film together - Dum Laga Ke Haisha, the duo were seen again in the romantic comedy Shubh Mangal Saavdhan, and created magic yet again. This time though Bhumi was seen in a completely new avatar. She lost all the extra pounds that she gained for her role of a plump Sandhya in the 2015 movie Dum Laga Ke Haisha and impressed her fans with her new lean avatar. Fans have been eagerly waiting for the couple to recreate the magic of love just like they did in their previous appearance together. Like her previous movies, Shubh Mangal Saavdhan also has a message to share and deals with the touchy subject of erectile dysfunction in men and how it affects the life of a couple about to get married. Only two movies old, actress Bhumi Pednekar has been praised a lot for her acting skills. She won all the debut awards for her role in Dum Laga Ke Haisha and now she has won our hearts with her inspiring weight-loss journey. At a tender age of 18, Bhumi shocked her family with not just her decision of entering the world of movies but also the choice of an unconventional debut. While girls her age were cautious about how they look, Bhumi (who was selected after a series of auditions) was asked to put on about 20-25 kilos for the role. She gorged on high calorie foods like butter chicken, dal makhani, pizzas, Mughlai dishes, sweets and paranthas, day in and day out, and weighed about 86 kilos by the time the movie went on floors. While her detractors assumed Bhumi would be type-casted as the ‘fat girl’ and be offered similar roles, Bhumi chose a different path. She went all out loosing those extra pounds she had gained, and by the time the film was released she had already lost 10 kilos. In a matter of four months she managed to loose 21 kilos! With the help of her trainer who planned a fantastic workout regime and diet and some tips from her mother, she's back into the best shape of her life and is inspiring all of us to get fit. She has taken to Instagram to share her fitness routine and diet plan with all her followers in hope that it might encourage them too. In one of her interviews, Bhumi recalls how she was never a skinny girl, but she always had a healthy height and weight proportion. In her interview to a leading magazine, she shared that she had a lot of weight in her body to start doing high intensity exercises right away. Therefore, she had to first condition her joints and prepare her body for the intense workout slowly and steadily. Her routine included running, working on machines, functional training, swimming and Bollywood dancing. An avid lover of dance, Bhumi believes dance serves as a great way to do cardio, and is an incredible way to tone up if someone wants to infuse a fun element into their otherwise monotonous workout routine. Bhumi had to face several problems because of the excess weight she was carrying. Her back would hurt, her ankles would swell up. After months of hard work, she is finally feeling comfortable with her body weight. Bhumi woke up everyday and hit the gym. When she couldn't do so, she would take a steam and sauna, and soak in the energy. We were thrilled to know that her doting mother specially created a meal plan for Bhumi to help her reach her weight loss goals. Salads were given an experimental touch with home-made dressings and cold-pressed oils. Hummus was used a lot - in sandwiches, with rotis and over veggies and meat. Bhumi also gave up white sugar, refined oils, refined flours and alcohol. They baked their own bread with whole wheat flour. Her chapatis had less wheat and more wholegrain flour made of ragi, amaranth and chana. Her daily diet is something we can all take a cue from. After all, a balanced diet is the best way to lose weight and also maintain it. Bhumi would also begin her day with a glass of aloe-vera juice on an empty stomach. For breakfast, she eats an omelette made with three egg whites and herbs along with multi-grain bread or granola with skimmed milk. Then, she heads for her workout for an hour or so, post which she has her post workout snack rich in protein channa, chicken or fish. For lunch, she likes to have a desi meal with a bowl of vegetables tossed in olive oil, dal tadka, 2 chapatis made with a mix of bajra, jowar, soya and amaranth flour. A dash of butter over the chapattis is regular affair for Bhumi. She also drinks a big glass of buttermilk and has bowl of curd alongside. In the evening, snacks consist of a bowl of seasonal fruits, usually, papaya or an apple helps Bhumi fight the evening hunger pangs with a cup of green tea. At around 7 p.m she has salad filled with greens, seasonal veggies or fruits like apple, dried berries or some walnuts, dressed with olive oil and balsamic vinegar or some olive chilli oil with garlic and mustard or some apple cider vinegar. Her early dinner consists of grilled chicken or fish with brown rice. In case, she is having a vegetarian meal, it will be fresh grilled paneer or tofu with stir fried or steamed veggies. Bhumi also recommends a bunch of healthy smoothies and snacks you can enjoy instead of the the high-calorie junk food like a berry smoothie, kale and soya chips, whole wheat lavash with hummus, or even dry roasted grains like puffed bajra. 1COMMENTSHer efforts to reach out to her fans and share her fitness secrets to inspire them is quite thoughtful and can help many who are struggling to lose weight. Way to go Bhumi!